[PENDING] - Full Caravan 2 criterias not count. [PENDING] - Ready, Set, Goat! [PENDING] Fire in the Yaung-hole! [PENDING] - Breaker of chains doesnt work because Frozen slaves are friendly/ cant be freed. [PENDING] - Delectable ogre delicacies cannot be completed due to not being able to obtain the buffs. [FIXED] - Writing in the snow cannot be completed due to Tattered journal page not being spawned. [PENDING] - Suramar world quests can be completed without Nightfallen but not forgotten (though they should be locked before this achievement is completed. [PENDING] - Why cant I hold all this mana doesnt count any items in Suramar. 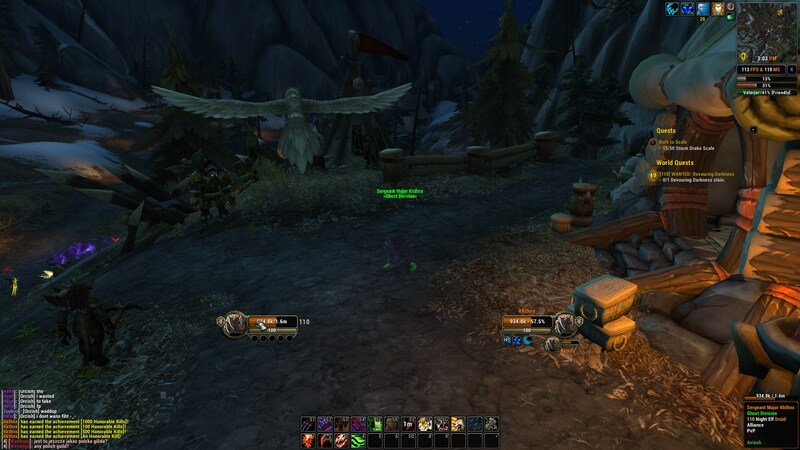 [PENDING] - Hatchling of the Talon can't be achieved since the NPC doesn't actually offer the option to take the test . [FIXED] - Make Love not Warcraft Not working! [FIXED] - Blackfathom deeps achievement isnt awarded on kill. [PENDING] WE'RE NOT RETREATING; WE'RE ADVANCING IN A DIFFERENT DIRECTION. [PENDING] THE ANTECHAMBER OF ULDUAR (10 PLAYER) Assembly of Iron doesn't count towards the achievement. [PENDING] THE ANTECHAMBER OF ULDUAR (25 PLAYER) Assembly of Iron doesn't count towards the achievement. [PENDING] DO A BARREL ROLL! [PENDING] HOW DID HE GET UP THERE? [PENDING] WHAT DOES THIS BUTTON DO? [PENDING] WHERE'S MY AIR SUPPORT? [PENDING] SORRY, WERE YOU LOOKING FOR THIS? [PENDING] WHO'S GOT TWO GREEN THUMBS? [PENDING] FIRE IN THE HOLE! [PENDING] GAMON WILL SAVE US! [PENDING] LASERS AND MAGNETS AND DRILLS! OH MY! [FIXED] HC: Will of the emperor does not trigger. [PENDING] - Got to ketchum all - the vendor selling the item for this achievement isnt spawned (Mushroom merchant). [PENDING] - Getting your hands dirty cannot be completed because digsite completion doesnt count towards progression. [PENDING] - Shifting through sand cannot be completed because digsite completion doesnt count towards progression. [PENDING] - No stone unturned cannot be completed because digsite completion doesnt count towards progression. [PENDING] - The search for fact not truth cannot be completed because obtaining the items doesnt count towards progression. [FIXED] - [Pet Charmer] The counter is not working. [FIXED] Shop smart, shop pet... Smart doesn't reward you with the pet "Stinker" as it should. [FIXED] Lil' game Hunter doesn't reward you with Little fawn's salt lick as it should. [FIXED] Raiding with leashes III: Drinkin' from the sunwell doesn't reward you with Holy Chime as it should. [FIXED] Raiding with Leashes IV: Wrath of the Lick King doesn't reward you with Celestial Invitation as it should. [FIXED] So many pets doesn't reward you with Stormwing as it should. [FIXED] Draenor Safari doesn't reward you with Royal Peacock as it should. [FIXED] Broken Isles Safari doesn't reward you with Rescued fawn as it should. [FIXED] An awfully big adventure doesn't reward you with Trunks as it should. [FIXED] Battle on the broken isles doesn't reward you with Pocket Pet Portal as it should. [FIXED] Family Familiar doesn't reward you with Nightmare treant as it should. [FIXED] Taming the world doesn't reward you with Safari hat as it should. [FIXED] - What a strange interdimensional trip it's been doesn't reward you with Trans-dimensional bird whistle as it should. [FIXED] - The Toymaster doesn't reward you with the Robo gnomebulator upon completion. [FIXED] - Remember to share doesn't reward you with the Mechanized Lumber Extractor upon completion. [FIXED] - Awaken the Drakes After the transfer from MoP to Legion , the mounts are not counting for the achivement. Also the vote drakes dosent count to. [FIXED] - Awake the drakes doesn't reward you with the Reins of the emerald drake upon completion. [FIXED] - Theres a Boss in there Not working. [FIXED] - Need Backu Not working. [PENDING] - Champions Rise The achivement is not working to all players. ANY OFF-TOPIC or POSTING OF SOMETHING ALREADY REPORTED WILL BE REMOVED!!! All achievements depending of a target zone have been fixed (so including this one). can't be achieved since the NPC doesn't actually offer the option to take the test . Heirloom Hoarder achievement does not give mount reward. I'll edit my post in a bit to see if 10 man works. [Kkthnx] has earned the achievement [1000 Honorable Kills]! [Kkthnx] has earned the achievement [100 Honorable Kills]! [Kkthnx] has earned the achievement [500 Honorable Kills]! [Kkthnx] has earned the achievement [An Honorable Kill]! You should get them 1 at a time not all at once, once you reach 1000Hks. I done all quest in Eastern Plaguelands but i miss two ppl for full caravan achivment and i done quest for them. Can we get this fixed it is messing up my addon code. Bug description: Going there does not reward the achievement. can you fix those achievements that reward mounts first? Bug description: It doesent Always Complete!